Designed to detect the fossil radiation of the Universe, the Planck satellite, working in tandem with Herschel, can also help to understand the macrostructure of the Universe. A just-published experimental study, carried out with the participation of SISSA, has detected astronomical sources that may be precursors to galaxy clusters, the largest dynamically stable structures existing in the Universe. These primitive elements have long been sought by astrophysicists since they are crucial for tracing the development of the Universe’s macrostructures. "Planck detects, then Herschel analyzes". That's how Gianfranco De Zotti, professor at the International School for Advanced Studies (SISSA) in Trieste and at INAF-Astronomical Observatory of Padova, summarizes the rationale of the study just published in Astronomy & Astrophysics. "As Mattia Negrello had already suggested in 2005, it is precisely Planck's low resolution - optimized for the study of the cosmic microwave background but a major limitation for identifying extragalactic sources - which makes the satellite a powerful tool in the search for large-scale structures. And today we finally have the first experimental proof". But let's take a step back. Planck is a satellite that has scanned the entire sky. It was designed to observe cosmic background radiation, that is, the residual electromagnetic energy that permeates the Universe and comes straight from the Big Bang. Its eye does not have excellent resolution (its vision is not sharp enough to see single objects of a certain type), but it's able to provide coverage of the whole sky. Galaxy proto-clusters are the precursors of the largest dynamically stable structures in our Universe. These clusters contain many galaxies at high "redshift" (i.e., shifting towards the red end of the spectrum, a parameter astrophysicists use for calculating their distance). Given that these structures are rare and large, Planck's ability to capture the overall picture makes it particularly suited to detecting them. In 2005, Mattia Negrello's PhD thesis at SISSA proposed a series of theoretical considerations supporting the use of Planck for this type of observation. The doubts mainly concerned the hypothesis that proto-clusters could contain a sufficient number of intensely star-forming galaxies for them to be identified by Planck. Now, an international group of scientists has just demonstrated, on the basis of observational evidence, that Negrello's hypotheses were well founded. Planck has provided the first all-sky map of high redshift sources, and with the help of the Herschel satellite (which has a "sharper" vision but coverage limited to a small portion of the sky), a more advanced characterization of these sources is being attempted. The authors of the study, led by Hervé Dole of the Institute of Space Astrophysics in Orsay, include Negrello (now at INAF-Astronomical Observatory of Padova), and De Zotti, a member of the SISSA "Planck group". "Thanks to this new study, we now hope that Planck will be able to play a major role in research into the large-scale structure of the Universe", concludes De Zotti. The study's point of departure was that higher latitudes are indeed warming faster than lower ones, which means that the temperature difference between the equator and the poles is decreasing. Imagine for a moment that this temperature difference no longer exists. This would mean that air masses would have the same temperature, regardless of whether they flow from the south or north. In theory there would no longer be any temperature variability. Such an extreme scenario will not occur, but it illustrates the scientists' theoretical approach. Temperature extremes will therefore become rarer as this variability is reduced. But this does not mean there will be no temperature extremes in the future. "Despite lower temperature variance, there will be more extreme warm periods in the future because the Earth is warming," says Schneider. The researchers limited their work to temperature trends. Other extreme events, such as storms with heavy rain or snowfall, can still become more common as the climate warms, as other studies have shown. And the jet stream? Schneider shrugs off the idea: "The waviness of the jet stream that makes our day-to-day weather does not change much." Changes in the north-south difference in temperatures play a greater role in modifying temperature variability. Many new and enigmatic high redshift galaxies that are intensively forming stars have been discovered using ESA’s Planck and Herschel satellites . These galaxies occur in clumps – and could be the long-sought formation phase of galaxy clusters. Some appear very bright, and have been found to be gravitationally lensed galaxies. These rapidly star-forming galaxies could help solve a central problem in cosmology: how did the large scale structure of galaxies form? From the standpoint of galaxy evolution, studying the intense star-formation epoch in massive dark-matter halos will provide a wealth of information on the kinematics and evolutionary history of galaxies in massive galaxy clusters. For cosmology, galaxy clusters tell us about the baryon content of the Universe, the role of dark matter in the assembly of large scale structure, and provides insights into possible deviations from our simple, Gaussian, model of the early universe. This means that the search for distant galaxy clusters and/or galaxies amplified by gravitational lensing is a very hot topic. ESA’s Planck satellite can find these rare objects over the entire sky, while ESA’s Herschel space observatory can scrutinize them in fine detail. Galaxies like our Milky Way with its 100 billion stars are usually not found in isolation. In the Universe today, 13.8 billion years after the Big Bang, many are in dense clusters of tens, or even hundreds of galaxies. Now, using the combined strengths of the Herschel Space Observatory and the Planck Satellite, astronomers have found objects in the distant Universe, seen at a time when it was only three billion years old, which could be precursors of the clusters seen around us today. "Because we are looking so far back in time, and because the the universe is assumed to be homogenous in all directions, we think it's very similar to looking at the equivalent of what a baby cluster might look like," said Brenda L. Frye, an assistant astronomer at the University of Arizona's Steward Observatory who was involved in the research. "In contrast to previous observations, for which the odd one or two baby clusters was found which one would put in a zoo, we now have found a real sample of 200 baby clusters." This image, taken by the Hubble Space Telescope Focuses on two different galaxies, one named "10" and another named "15." Neither object looks as big and beautiful as the Milky Way but nonetheless they are still each a galaxy. 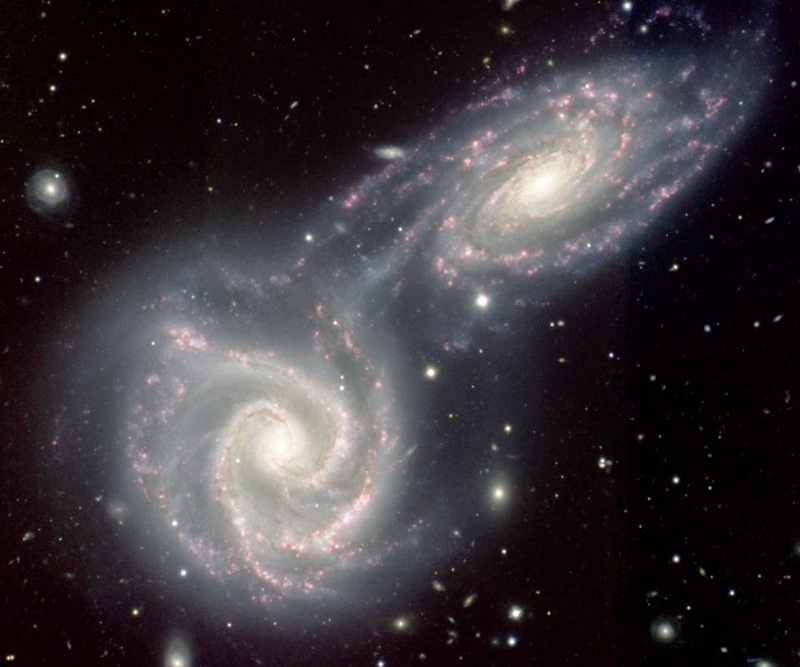 Interestingly, galaxies 10 and 15 appear to have identical twins, as indicated. In actual fact there is only one real galaxy 10 and one real galaxy 15, and a natural telescope in space has "photocopied" their images on the sky so now there appear two of them. Trying to sort out optical illusions like this one is part of Brenda Frye's research in this joint Planck-Herschel Space Observatory collaboration. The main goal of Planck, a space observatory operated by the European Space Agency, was to provide the most precise map of the relic radiation of the Big Bang, the cosmic microwave background. To do so, it surveyed the entire sky in nine different wavelengths from the far-infrared to radio, in order to eliminate foreground emission from our galaxy and others in the Universe. Another space observatory - Herschel - then observed these objects across the far-infrared to submillimeter wavelength range (just a bit shorter than microwaves), but with much higher sensitivity and angular resolution. Herschel revealed that the vast majority of the Planck-detected sources are consistent with dense concentrations of galaxies in the early Universe, vigorously forming new stars. Each of these young galaxies is seen to be converting gas and dust into stars at a rate of a few hundred to 1,500 times the mass of our sun per year. By comparison, our own Milky Way galaxy today is producing stars at an average rate of just one solar mass per year. "It was not known whether young galaxies form stars gradually, like marathon runners pacing themselves or in bursts," Frye said. "It turns out these young galaxies were not forming slowly, but in a dramatic way. Lighting up with star formation, they appear like fireworks going off in the sky. It's like sprinting the first mile of a 26-mile marathon, and then walking the rest of the way." Because of their extreme distance, astronomers would not be able to see these "fireworks" in single galaxies, but because most occur in clusters, they appear bright. However, here and there, they detected single galaxies that appeared much brighter than they should. "In a small number of cases, we are finding only one object instead of a cluster, which we shouldn't be able to see, so there is some other mystery there," Frye said. An expert in gravitational lensing, Frye was called in to join the research team to study those rare cases of "mystery fireworks galaxies." "The answer is that these objects are brightened up by what you could call a natural telescope in space," she explained. "In a few cases, we can see individual far-away galaxies lighting up with star formation because they are situated along just at the right line of sight where their light passes through a massive galaxy clusters close to Earth." 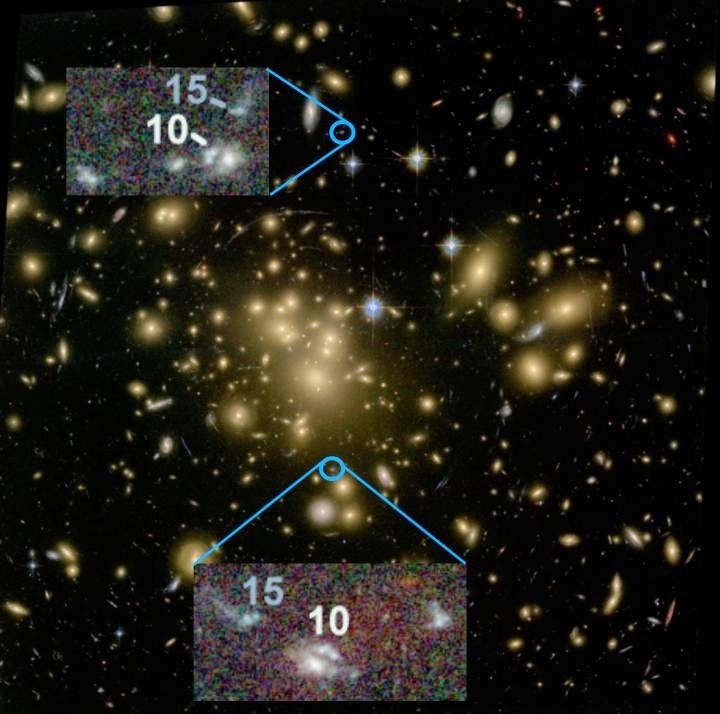 As predicted by Einstein's Theory of General Relativity, the foreground cluster bends the light from the background galaxy due to its gravity, resulting in an image of the far-away galaxy that is boosted in brightness. "Why we find these enigmatic examples of single ones when they should be in clusters, is what we're studying here at the UA," Frye said. "These might be fainter examples in general, or they, too, may have friends, which haven't turned on their fireworks just yet." Frye took advantage of a spectrograph instrument called Hectospec at the MMT Observatory, a partnership between the UA and the Smithsonian Institution of Astrophysics. "Hectospec acts like a prism, breaking the emissions coming from those protogalaxies into a rainbow of light, so we can very quickly study these really interesting objects, which may have been very much like what the Milky Way may have looked like earlier in cosmic history." "A key feature that sets our instrument apart from the rest of the world is that we can get the spectra of 300 objects at the same time," Frye said. 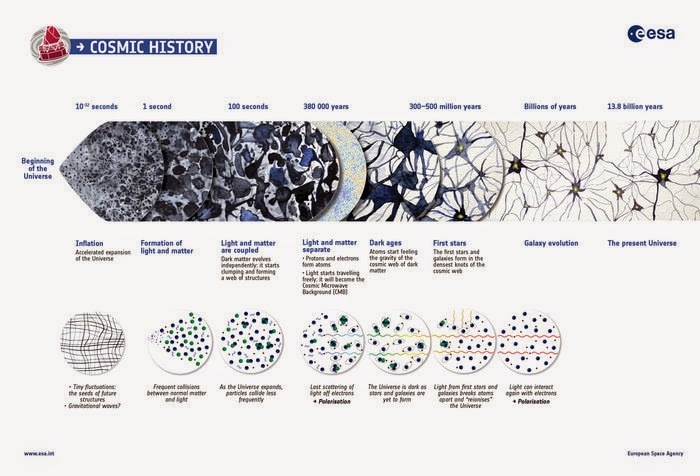 The timeline in the upper part of the illustration shows an artistic view of the evolution of the cosmos on large scales. The processes depicted range from inflation, the brief era of accelerated expansion that the Universe underwent when it was a tiny fraction of a second old, to the release of the CMB, the oldest light in our Universe, imprinted on the sky when the cosmos was just 380 000 years old; and from the ‘Dark Ages’ to the birth of the first stars and galaxies, which reionised the Universe when it was a few hundred million years old, all the way to the present time. While the astronomers have not yet conclusively established the ages and luminosities of many of these newly discovered distant galaxy concentrations, they are the best candidates yet found for 'proto-clusters' - precursors of the large, mature galaxy clusters we see in the universe today. "Hints of these kinds of objects had been found earlier in data from Herschel and other telescopes, but the all-sky capability of Planck revealed many more candidates for us to study," said Hervé Dole of the Institut d'Astrophysique Spatiale in Orsay, France, lead scientist of the analysis published in the journal Astronomy & Astrophysics. "We still have a lot to learn about this new population, requiring further follow-up studies with other observatories. But we believe that they are a missing piece of cosmological structure formation." 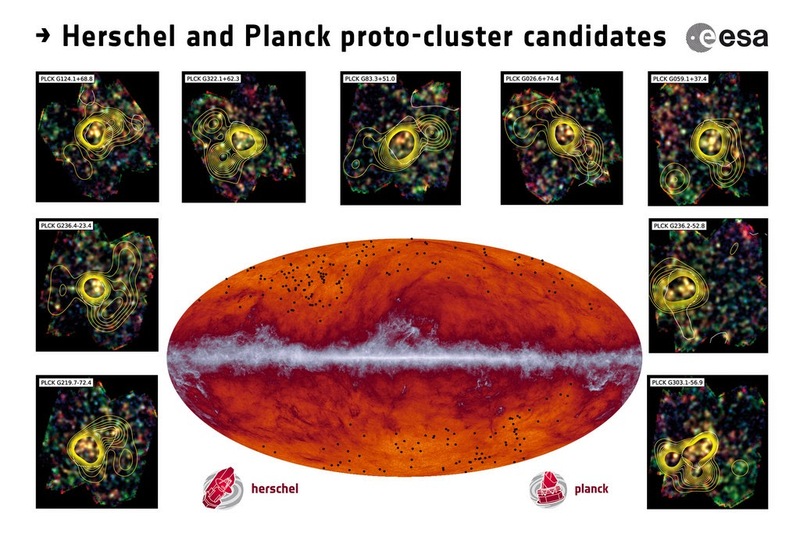 "We are now preparing an extended catalogue of possible proto-clusters detected by Planck, which should help us identify even more of these objects," added Ludovic Montier of the Institut de Recherche en Astrophysique et Planétologie in Toulouse, France, who is the lead scientist of the Planck catalogue of high-redshift source candidates, which is about to be delivered to the community. Citation: "High-redshift infrared galaxy overdensity candidates and lensed sources discovered by Planck and confirmed by Herschel-SPIRE," is authored by the Planck Collaboration. Washington State University researchers have found that an unexpectedly high percentage of young people experience "exploding head syndrome," a psychological phenomenon in which they are awakened by abrupt loud noises, even the sensation of an explosion in their head. Brian Sharpless, a Washington State University assistant professor and director of the university psychology clinic, found that nearly one in five -- 18 percent -- of college students interviewed said they had experienced it at least once. It was so bad for some that it significantly impacted their lives, he said. "Unfortunately for this minority of individuals, no well-articulated or empirically supported treatments are available, and very few clinicians or researchers assess for it," he said. The study also found that more than one-third of those who had exploding head syndrome also experienced isolated sleep paralysis, a frightening experience in which one cannot move or speak when waking up. People with this condition will literally dream with their eyes wide open. The study is the largest of its kind, with 211 undergraduate students interviewed by psychologists or graduate students trained in recognizing the symptoms of exploding head syndrome and isolated sleep paralysis. The results appear online in the Journal of Sleep Research. Based on smaller, less rigorous studies, some researchers have hypothesized that exploding head syndrome is a rare condition found mostly in people older than 50. "I didn't believe the clinical lore that it would only occur in people in their 50s," said Sharpless. "That didn't make a lot of biological sense to me." He started to think exploding head syndrome was more widespread last year when he reviewed the scientific literature on the disorder for the journal Sleep Medicine Reviews. In that report he concluded the disorder was a largely overlooked phenomenon that warranted a deeper look. The disorder tends to come as one is falling asleep. Researchers suspect it stems from problems with the brain shutting down. When the brain goes to sleep, it's like a computer shutting down, with motor, auditory and visual neurons turning off in stages. But instead of shutting down properly, the auditory neurons are thought to fire all at once, Sharpless said. "That's why you get these crazy-loud noises that you can't explain, and they're not actual noises in your environment," he said. The same part of the brain, the brainstem's reticular formation, appears to be involved in isolated sleep paralysis as well, which could account for why some people experience both maladies, he said. They can be extremely frightening. Exploding head syndrome can last just a few seconds but can lead some people to believe that they're having a seizure or a subarachnoid hemorrhage, said Sharpless. "Some people have worked these scary experiences into conspiracy theories and mistakenly believe the episodes are caused by some sort of directed-energy weapon," he said. 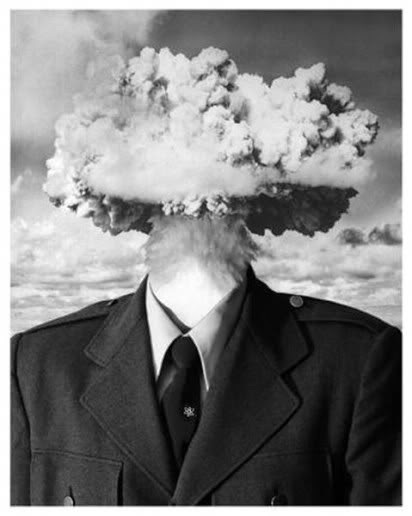 In fact, both exploding head syndrome and isolated sleep paralysis have been misinterpreted as unnatural events. The waking dreams of sleep paralysis can make for convincing hallucinations, which might account for why some people in the Middle Ages would be convinced they saw demons or witches. "In 21st century America, you have aliens," said Sharpless. "For this scary noise you hear at night when there's nothing going on in your environment, well, it might be the government messing with you." Some people are so put off by the experience that they don't even tell their spouse, he said. "They may think they're going crazy and they don't know that a good chunk of the population has had the exact same thing," he said. Neither disorder has a well-established treatment yet, though researchers have tried different drugs that may be promising, said Sharpless, co-author of the upcoming book, "Sleep Paralysis: Historical, Psychological, and Medical Perspectives." "One of the drugs they gave for exploding head syndrome actually didn't make the noises go away," he said. "It just turned the volume down." But many people are at least relieved to get a diagnosis and learn that they aren't alone. "There's the possibility that just being able to recognize it and not be afraid of it can make it better," Sharpless said. Credit: CCBY 4.0 Wang et al. "Brood care could have been an important driver for the early radiation of scale insects, which occurred during the end of the Jurassic or earliest Cretaceous period during the Mesozoic era," says lead author Bo Wang, an associate professor at the Chinese Academy of Sciences. "Although analysis seemed to suggest that ancient insects evolved brood care, this is the first direct, unequivocal evidence for the fossil record," says Wang. Professor Wang led the international team of scientists from the Chinese Academy of Sciences, the University of Bonn (Germany), the Natural History Museum (London), the University of Silesia, and the University of Gdansk (Poland). Citation: The paper 'Brood care in a 100-million-year-old scale insect' can be freely accessed online athttp://dx.doi.org/10.7554/eLife.05447. Contents, including text, figures, and data, are free to re-use under a CC BY 4.0 license. Dark matter is one of science's great mysteries. It makes up an enormous amount matter in the universe, it is invisible, and it does not correspond to anything in the realm of our experience. Different theories compete for an explanation, but so far none of them has prevailed. In a collaborative study between École Polytechnique Fédérale de Lausanne (EPFL) and the University of Edinburgh, scientists have studied how dark matter behaves when galaxy clusters collide with each other over billions of years. Published in Science, their findings challenge at least one major theory on dark matter. Although it accounts for 90% of all matter in the universe and more than a quarter of its energy, we know very little about dark matter. One major idea among astronomers is that dark matter consists of a new subatomic particle that we haven't discovered yet. More exotic theories want dark matter to be a quantum defect from the birth of the universe, extra-dimensional mass, and even a modified form of gravity. What we do know is that dark matter interacts with cosmic structures through gravity, shaping and molding them. For example, dark matter bends light that passes through it, distorting images of distant space objects. In addition, dark matter speeds up the motion of galaxies inside galaxy clusters, which are collections of hundreds of galaxies, containing literally astronomical amounts of stars, planets, and gases. Galaxy clusters are also 90% dark matter, which makes them ideal for studying it, especially when they collide into each other and force their respective dark matters to interact. David Harvey at EPFL's Laboratory of Astrophysics studies galaxy cluster collisions to find clues about the nature of dark matter. Continuing his PhD work from the Royal Observatory at Edinburgh, he and his colleagues studied data from 72 galaxy cluster collisions. These cosmic crashes happen over the course of billions of years when galaxy clusters attract each other because of their gargantuan masses. When this happens, the dark matter in each galaxy cluster interacts with that of the other, offering a unique opportunity to study it. Harvey's data came from the Chandra X-ray Space Observatory and the Hubble telescope, and included the famous Bullet Cluster collision, a collision of two galaxy clusters whose gas has been molded into the shape of a bullet. This particular collision is actually the best current evidence for the existence of dark matter. The researchers analyzed the collision data to measure the change in momentum of dark matter when two galaxy clusters crashed into each other. Experiments on Earth, e.g. in the Large Hadron Collider, show us that when subatomic particles interact, they exchange momentum. Therefore, depending on what happened to the dark matter after the collision, the researchers could draw conclusions about its nature. To test the theory that dark matter consists of particles, the study worked with two possible scenarios: Either the particles of the dark matter interacted frequently but exchanged little momentum, or they interacted rarely but exchanged a lot of momentum. In the first case, dark matter would slow down after the collision, because the frequent particle interactions would cause an additional "drag". In the second scenario, dark matter would tend to be scattered away and lost into space. Surprisingly, the study discovered that dark matters in galaxy cluster collisions simply pass through each other. This implies that dark matter particles do not interact with themselves, which would have caused dark matter to slow down. Instead, it appears that while dark matter could interact "non-gravitationally" with visible matter, this is not the case when it interacts with itself. More importantly, the study challenges the view that dark matter consists of proton-like particles - or perhaps any particles whatsoever. "We have now pushed the probability of two 'dark matter particles' interacting below the probability of two actual protons interacting, which means that dark matter is unlikely to consist of just 'dark-protons'," says David Harvey. "If it did, we would expect to see them 'bounce' off each other". This work represents a collaboration of EPFL's Laboratory of Astrophysics with the Royal Observatory at the University of Edinburgh, the Institute for Computational Cosmology at Durham University, and the Mullard Space Science Laboratory at University College London. This is a 3-D reconstruction of the auditory ossicle of a two-year-old Neanderthal. Among the remains discovered at La Ferrassie is the skeleton of a 2-year-old Neanderthal child found between 1970 and 1973 and baptised La Ferrassie 8; over 40 years since its discovery it has turned out to be useful in shedding new light on the anatomy of this extinct species. This stapes is the most complete one in the Neanderthal record and certifies that there are morphological differences between our species and the Neanderthals even in the smallest ossicles in the human body. As Asier Gómez-Olivencia pointed out, "we do not yet know the relation between these morphological differences and hearing in the Neanderthals. This would constitute a new challenge for the future". The study of these new remains has been published in the prestigious Journal of Human Evolution, and has also had the participation of researchers of the CNRS (French National Centre for Scientific Research) in Paris and Bordeaux. The fact that a discovery of such significance has been made thanks to reviewing the remains excavated in the 1970s provides the researcher with proof of "the importance and need to review old excavations. We're in no doubt about that". Asier Gómez-Olivencia, a doctor in Human Palaeontology, did research at the University of Cambridge and at the Muséum National d'Histoire Naturelle in France, until 2014 when he joined the UPV/EHU's Department of Stratigraphy and Palaeontology as an Ikerbasque Research Fellow. Astronomers using observations from the NASA/ESA Hubble Space Telescope and NASA's Chandra X-ray Observatory have studied how dark matter in clusters of galaxies behaves when the clusters collide. The results, published in the journal Science on 27 March 2015, show that dark matter interacts with itself even less than previously thought, and narrows down the options for what this mysterious substance might be. This collage shows NASA/ESA Hubble Space Telescope images of six different galaxy clusters. The clusters were observed in a study of how dark matter in clusters of galaxies behaves when the clusters collide. 72 large cluster collisions were studied in total. The clusters shown here are, from left to right and top to bottom: MACS J0416.1-2403, MACS J0152.5-2852, MACS J0717.5+3745, Abell 370, Abell 2744 and ZwCl 1358+62. Dark matter is a giant question mark looming over our knowledge of the Universe. There is more dark matter in the Universe than visible matter, but it is extremely elusive; it does not reflect, absorb or emit light, making it invisible. Because of this, it is only known to exist via its gravitational effects on the visible Universe (see e.g. heic1215a). To learn more about this mysterious substance, researchers can study it in a way similar to experiments on visible matter -- by watching what happens when it bumps into things . For this reason, researchers look at vast collections of galaxies, called galaxy clusters, where collisions involving dark matter happen naturally and where it exists in vast enough quantities to see the effects of collisions . Galaxies are made of three main ingredients: stars, clouds of gas and dark matter. During collisions, the clouds of gas spread throughout the galaxies crash into each other and slow down or stop. The stars are much less affected by the drag from the gas  and, because of the huge gaps between them, do not have a slowing effect on each other -- though if two stars did collide the frictional forces would be huge. "We know how gas and stars react to these cosmic crashes and where they emerge from the wreckage. Comparing how dark matter behaves can help us to narrow down what it actually is," explains David Harvey of the École Polytechnique Fédérale de Lausanne (EPFL) in Switzerland, lead author of a new study. Harvey and his team used data from the NASA/ESA Hubble Space Telescope and NASA's Chandra X-ray Observatory to study 72 large cluster collisions. The collisions happened at different times, and are seen from different angles -- some from the side, and others head-on . The team found that, like the stars, the dark matter continued straight through the violent collisions without slowing down. However, unlike in the case of the stars, this is not because the dark matter is far away from other dark matter during the collisions. The leading theory is that dark matter is spread evenly throughout the galaxy clusters so dark matter particles frequently get very close to each other. The reason the dark matter doesn't slow down is because not only does it not interact with visible particles, it also interacts even less with other dark matter than previously thought. "A previous study had seen similar behaviour in the Bullet Cluster," says team member Richard Massey of Durham University, UK. "But it's difficult to interpret what you're seeing if you have just one example. Each collision takes hundreds of millions of years, so in a human lifetime we only get to see one freeze-frame from a single camera angle. Now that we have studied so many more collisions, we can start to piece together the full movie and better understand what is going on." By finding that dark matter interacts with itself even less than previously thought, the team have successfully narrowed down the properties of dark matter. Particle physics theorists have to keep looking, but they now have a smaller set of unknowns to work with when building their models. Dark matter could potentially have rich and complex properties, and there are still several other types of interaction to study. These latest results rule out interactions that create a strong frictional force, causing dark matter to slow down during collisions. Other possible interactions could make dark matter particles bounce off each other like billiard balls, causing dark matter to be thrown out of collisions or for dark matter blobs to change shape. The team will be studying these next. To further increase the number of collisions that can be studied, the team are also looking to study collisions involving individual galaxies, which are much more common. "There are still several viable candidates for dark matter, so the game is not over, but we are getting nearer to an answer," concludes Harvey. "These 'Astronomically Large' particle colliders are finally letting us glimpse the dark world all around us but just out of reach." On Earth scientists use particle accelerators to find out more about the properties of different particles. Physicists can investigate what substances are made of by accelerating particles into a collision, and examining the properties and trajectory of the resulting debris. Clusters of galaxies are a swarm of galaxies permeated by a sea of hot X-ray emitting ionised hydrogen gas that is all embedded in a massive cloud of dark matter. It is the interactions of these, the most massive structures in the Universe that are observed to test dark matter's properties. The gas-gas interaction in cluster collisions is very strong, while the gas-star drag is weak. In a similar way to a soap bubble and a bullet in the wind where the bubble would interact a great deal more with the wind than the bullet. 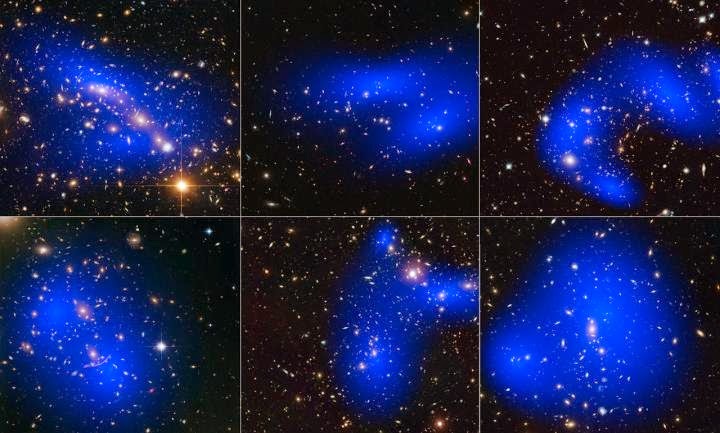 To find out where the dark matter was located in the cluster the researchers studied the light from galaxies behind the cluster whose light had been magnified and distorted by the mass in the cluster. Because they have a good idea of the visible mass in the cluster, the amount the light is distorted tells them how much dark matter there is in a region. A favoured theory is that dark matter might be constituted of "supersymmetric" particles. Supersymmetry is a theory in which all particles in our Standard Model -- electrons, protons, neutrons, and so on -- have a more massive "supersymmetric" partner. While there has been no experimental confirmation for supersymmetry as yet, the theory would solve a few of the gaps in our current thinking. One of supersymmetry's proposed particles would be stable, electrically neutral, and only interact weakly with the common particles of the Standard Model -- all the properties required to explain dark matter. One of the dominant theories of our evolution is that our genus, Homo, evolved from small-bodied early humans to become the taller, heavier and longer legged Homo erectus that was able to migrate beyond Africa and colonise Eurasia. While we know that small-bodied Homo erectus - averaging less than five foot (152cm) and under 50kg - were living in Georgia in southern Europe by 1.77 million years ago, the timing and geographic origin of the larger body size that we associate with modern humans has, until now, remained unresolved. This is a cast of the 'Nariokotome Boy' (Homo ergaster) skeleton. But a joint study by researchers at the Universities of Cambridge and Tübingen (Germany), published today in the Journal of Human Evolution, has now shown that the main increase in body size occurred tens of thousands of years after Homo erectus left Africa, and primarily in the Koobi Fora region of Kenya. According to Manuel Will, a co-author of the study from the Department of Early Prehistory and Quaternary Ecology at Tübingen, "the evolution of larger bodies and longer legs can thus no longer be assumed to be the main driving factor behind the earliest excursions of our genus to Eurasia". 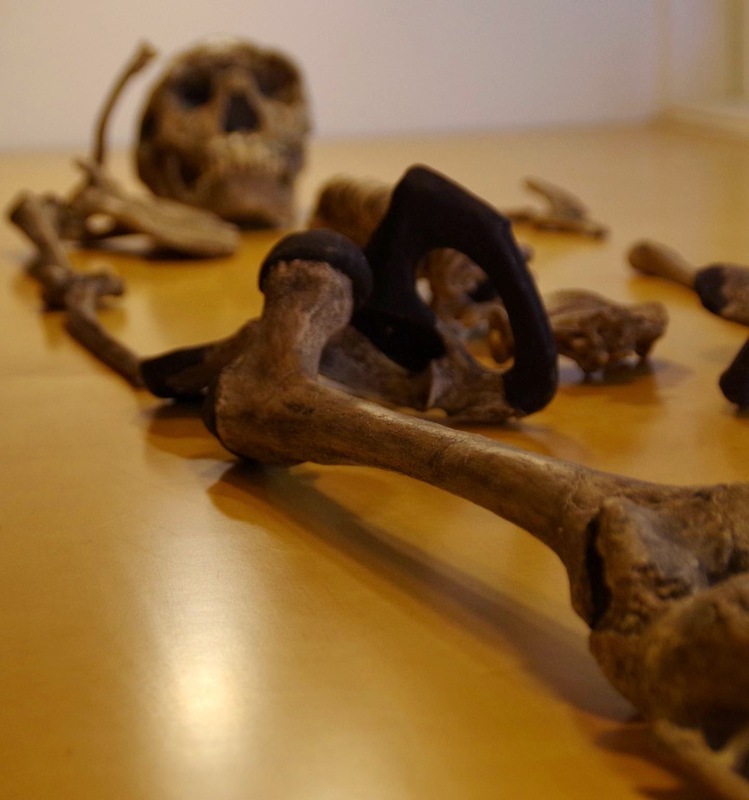 Researchers say the results from a new research method, using tiny fragments of fossil to estimate our earliest ancestors' height and body mass, also point to the huge diversity in body size we see in humans today emerging much earlier than previously thought. "What we're seeing is perhaps the beginning of a unique characteristic of our own species - the origins of diversity," said Dr Jay Stock, co-author of the study from the University of Cambridge's Department of Archaeology and Anthropology. "It's possible to interpret our findings as showing that there were either multiple species of early human, such as Homo habilis, Homo ergaster and Homo rudolfensis, or one highly diverse species. This fits well with recent cranial evidence for tremendous diversity among early members of the genus Homo." 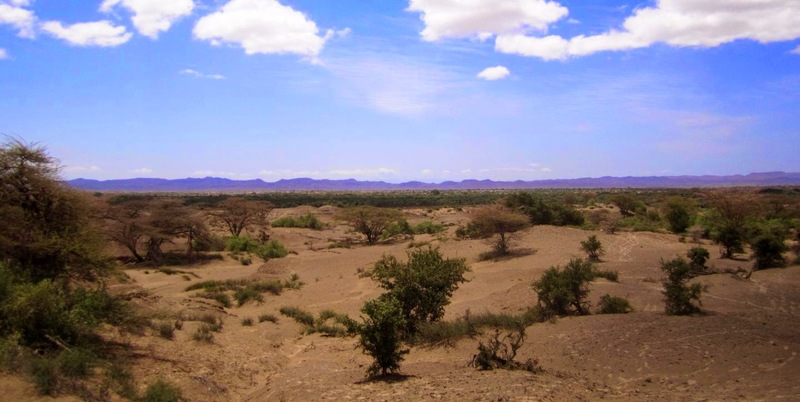 This is West Turkana, Kenya, where the Nariokotome boy skeleton was discovered. "If someone asked you 'are modern humans 6 foot tall and 70kg?' you'd say 'well some are, but many people aren't,' and what we're starting to show is that this diversification happened really early in human evolution," said Stock. The study is the first in 20 years to compare the body size of the humans who shared the earth with mammoths and sabre-toothed cats between 2.5 and 1.5 million years ago. It is also the first time that many fragmentary fossils - some as small as toes and tiny ankle bones no more than 5cm long - have been used to make body size estimates. Comparing measurements of fossils from sites in Kenya, Tanzania, South Africa, and Georgia, the researchers found that there was significant regional variation in the size of early humans during the Pleistocene. Some groups, such as those who lived in South African caves, averaged 4.8 feet tall; some of those found in Kenya's Koobi Fora region would have stood at almost 6 foot, comparable to the average of today´s male population in Britain. "Basically every textbook on human evolution gives the perspective that one lineage of humans evolved larger bodies before spreading beyond Africa. But the evidence for this story about our origins and the dispersal out of Africa just no longer really fits," said Stock. "The first clues came from the site of Dmanisi in Georgia where fossils of really small-bodied people date to 1.77 million years ago. This has been known for several years, but we now know that consistently larger body size evolved in Eastern Africa after 1.7 million years ago, in the Koobi Fora region of Kenya." "We tend to simplify our interpretations because the fossil record is patchy and we have to explain it in some way. But revealing the diversity that exists is just as important as those broad, sweeping explanations." Instead of waiting for new fossils to be discovered and hoping that they contained these specific bones, Stock and Will decided to try a different approach and make use of previously over-looked fossils. In what Stock describes as a "very challenging project," they spent a year developing new equations that allowed them to calculate the height and body mass of individuals using much smaller bones, some as small as toes. By comparing these bones to measurements taken from over 800 modern hunter-gatherer skeletons from around the world and applying various regression equations, the researchers were able to estimate body size for many new fossils that have never been studied in this way before. "In human evolution we see body size as one of the most important characteristics, and from examining these 'scrappier' fossils we can get a much better sense of when and where human body size diversity arose. Before 1.7 million years ago our ancestors were seldom over 5 foot tall or particularly heavy in body mass. "When this significant size shift to much heavier, taller individuals happened, it occurred primarily in one particular place - in a region called Koobi Fora in northern Kenya around 1.7 million years ago. That means we can now start thinking about what regional conditions drove the emergence of this diversity, rather than seeing body size as a fixed and fundamental characteristic of a species," said Stock. Stars form when gravity pulls together material within giant clouds of gas and dust. But gravity isn't the only force at work. Both turbulence and magnetic fields battle gravity, either by stirring things up or by channeling and restricting gas flows, respectively. New research focusing on magnetic fields shows that they influence star formation on a variety of scales, from hundreds of light-years down to a fraction of a light-year. 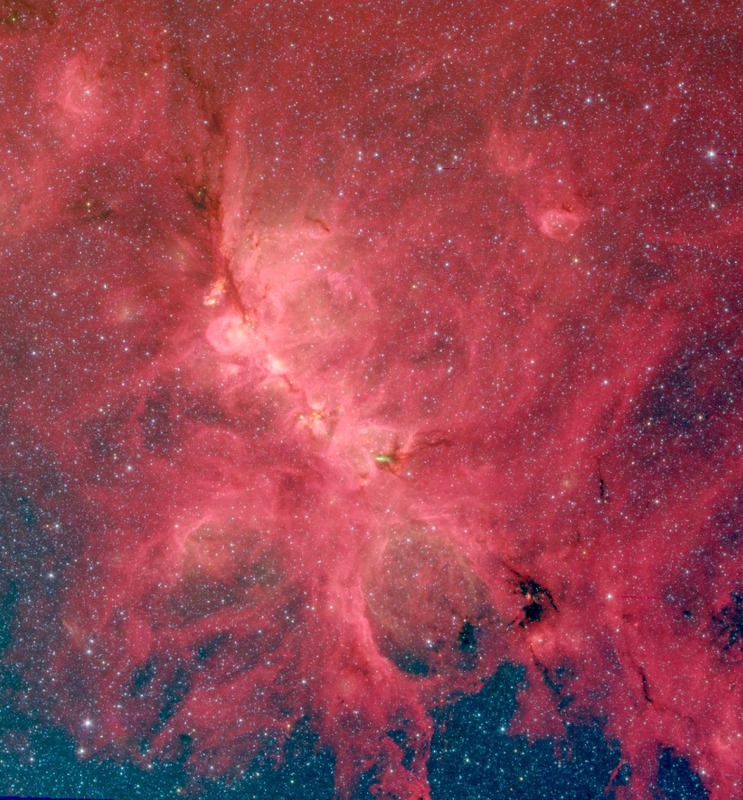 The Cat's Paw Nebula, also known as NGC 6334, comes alive in this infrared image from the Spitzer Space Telescope. A new study of this nebula finds that magnetic fields influence star formation on a variety of scales, from hundreds of light-years down to a fraction of a light-year. In this representative-color photo red shows light at a wavelength of 8 microns, green is 4.5 microns, and blue is 3.6 microns. The new study, which the journal Nature is publishing online on March 30th, probed the Cat's Paw Nebula, also known as NGC 6334. This nebula contains about 200,000 suns' worth of material that is coalescing to form new stars, some with up to 30 to 40 times as much mass as our sun. It is located 5,500 light-years from Earth in the constellation Scorpius. The team painstakingly measured the orientation of magnetic fields within the Cat's Paw. "We found that the magnetic field direction is quite well preserved from large to small scales, implying that self-gravity and cloud turbulence are not able to significantly alter the field direction," said lead author Hua-bai Li (The Chinese University of Hong Kong), who conducted the high-resolution observations while a post-doctoral fellow at the Harvard-Smithsonian Center for Astrophysics (CfA). "Even though they're much weaker than Earth's magnetic field, these cosmic magnetic fields have an important effect in regulating how stars form," added Smithsonian co-author T.K. Sridharan (CfA). The team observed polarized light coming from dust within the nebula using several facilities, including the Smithsonian's Submillimeter Array. "The SMA's unique capability to measure polarization at high angular resolution allowed access to the magnetic fields at the smallest spatial scales," said SMA director Ray Blundell (CfA). "The SMA has made significant contributions in this field which continues with this work," said Smithsonian co-author Qizhou Zhang (CfA). Because dust grains align themselves with the magnetic field, the researchers were able to use dust emission to measure the field's geometry. They found that the magnetic fields tended to line up in the same direction, even though the relative size scales they examined were different by orders of magnitude. The magnetic fields only became misaligned on the smallest scales in cases where strong feedback from newly formed stars created other motions. This work represents the first time magnetic fields in a single region have been measured at so many different scales. It also has interesting implications for the history of our galaxy. When a molecular cloud collapses to form stars, magnetic fields hinder the process. As a result, only a fraction of the cloud's material is incorporated into stars. The rest gets dispersed into space, where it is available to make new generations of stars. Thanks to magnetic fields, the star-forming process is more drawn out. A team of scientists has a new explanation for the planet Mercury's dark, barely reflective surface. In a paper published in Nature Geoscience, the researchers suggest that a steady dusting of carbon from passing comets has slowly painted Mercury black over billions of years. New research suggests that carbon from cometary material that bombards the Mercury may be the reason the planet's surface is so dark. Experiments show that impact material is significantly darkened when impacts occur in the presence of complex organics. Mercury's dark surface has long been a mystery to scientists. On average, Mercury is much darker than its closest airless neighbor, our Moon. Airless bodies are known to be darkened by micrometeorite impacts and bombardment of solar wind, processes that create a thin coating of dark iron nanoparticles on the surface. But spectral data from Mercury suggests its surface contains very little nanophase iron, certainly not enough to account for its dim appearance. "It's long been hypothesized that there's a mystery darkening agent that's contributing to Mercury's low reflectance," said Megan Bruck Syal, a postdoctoral researcher at Lawrence Livermore National Laboratory who performed this research while a graduate student at Brown University. "One thing that hadn't been considered was that Mercury gets dumped on by a lot of material derived from comets." As comets approach Mercury's neighborhood near the sun, they often start to break apart. Cometary dust is composed of as much as 25 percent carbon by weight, so Mercury would be exposed to a steady bombardment of carbon from these crumbling comets. Using a model of impact delivery and a known estimate of micrometeorite flux at Mercury, Bruck Syal was able to estimate how often cometary material would impact Mercury, how much carbon would stick to Mercury's surface, and how much would be thrown back into space. Her calculations suggest that after billions of years of bombardment, Mercury's surface should be anywhere from 3 to 6 percent carbon. The next part of the work was to find out how much darkening could be expected from all that impacting carbon. For that, the researchers turned to the NASA Ames Vertical Gun Range. The 14-foot canon simulates celestial impacts by firing projectiles at up to 16,000 miles per hour. For this study, the team launched projectiles in the presence of sugar, a complex organic compound that mimics the organics in comet material. The heat of an impact burns the sugar up, releasing carbon. Projectiles were fired into a material that mimics lunar basalt, the rock that makes up the dark patches on the nearside of the Moon. 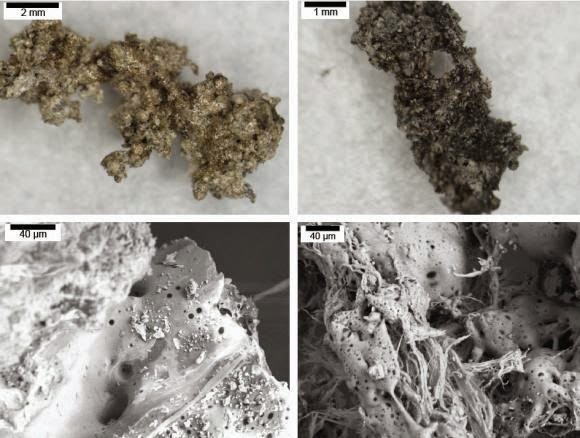 "We used the lunar basalt model because we wanted to start with something dark already and see if we could darken it further," said Peter Schultz, professor emeritus of geological sciences at Brown and a co-author of the new research. The experiments showed that tiny carbon particles become deeply embedded in the impact melted material. The process reduced the amount of light reflected by the target material to less than 5 percent -- about the same as the darkest parts of Mercury. Importantly, spectroscopic analysis of the impact samples revealed no distinctive spectral fingerprints, again similar to flat spectral signatures from Mercury. "We show that carbon acts like a stealth darkening agent," Schultz said. "From the standpoint of spectral analysis, it's like an invisible paint." And that paint has been building up on Mercury's surface for billions of years. "We think this is a scenario that needs to be considered," Schultz said. "It appears that Mercury may well be a painted planet." Assistant Attorney General Leslie R. Caldwell of the Justice Department’s Criminal Division, U.S. Attorney Melinda Haag of the Northern District of California, Special Agent in Charge David J. Johnson of the FBI’s San Francisco Division, Special Agent in Charge José M. Martinez of the Internal Revenue Service-Criminal Investigation’s (IRS-CI) San Francisco Division, Special Agent in Charge Michael P. Tompkins of the Justice Department’s Office of the Inspector General Washington Field Office and Special Agent in Charge Lori Hazenstab of the Department of Homeland Security’s Office of the Inspector General in Washington D.C. made the announcement. 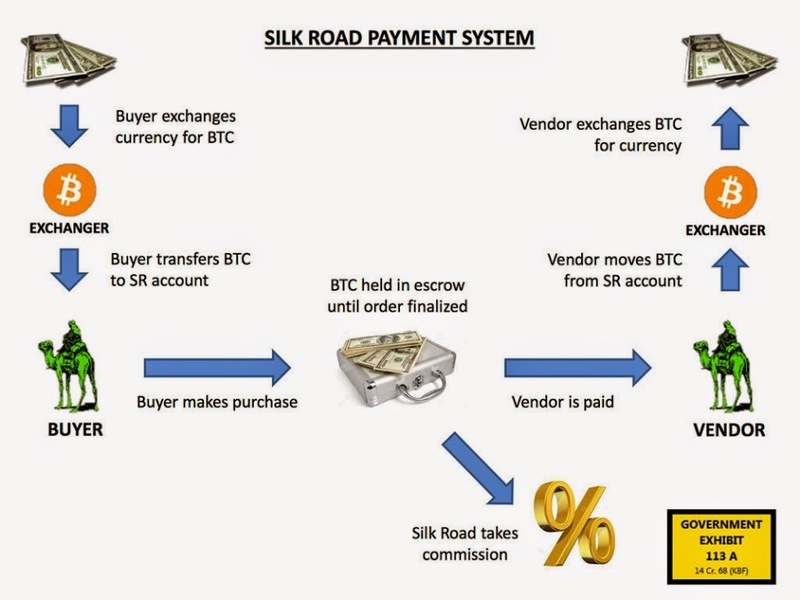 According to the complaint, Force was a DEA agent assigned to investigate the Silk Road marketplace. During the investigation, Force engaged in certain authorized undercover operations by, among other things, communicating online with “Dread Pirate Roberts” (Ulbricht), the target of his investigation. The complaint alleges, however, that Force then, without authority, developed additional online personas and engaged in a broad range of illegal activities calculated to bring him personal financial gain. In doing so, the complaint alleges, Force used fake online personas, and engaged in complex Bitcoin transactions to steal from the government and the targets of the investigation. Specifically, Force allegedly solicited and received digital currency as part of the investigation, but failed to report his receipt of the funds, and instead transferred the currency to his personal account. The case was investigated by the FBI’s San Francisco Division, the IRS-CI’s San Francisco Division, the Department of Justice Office of the Inspector General and the Department of Homeland Security Office of the Inspector General in Washington D.C. The Treasury Department’s Financial Crimes Enforcement Network also provided assistance with the investigation of this case. The case is being prosecuted by Assistant U.S. Attorneys Kathryn Haun and William Frentzen of the Northern District of California and Trial Attorney Richard B. Evans of the Criminal Division’s Public Integrity Section. Scientific Applications & Research Associates, Inc. (SARA) (Huntington Beach, CA) has developed a compact, lightweight, steerable, high-power, microwave weapon. The aimable, high-power microwave weapon uses a unique antenna to produce a highly focused beam of energy for contacting a target to neutralize the electrically driven systems such as found in missiles, airplanes and automobiles, accompanied by a low impact on human life. The antenna can carried on a surface a truck or air craft along with a feed mechanism such that the antennas are capable of folding into a storage configuration for rapid transport and then expansion into an upright stance for shooting a pencil-thin beam of high-energy microwave radiation at a moving target. The antenna shoots a high-powered microwave energy in a controllable fashion quickly and without the use of traditional large and cumbersome vacuum waveguides. The high-energy pulsed microwave energy beam can be used against a moving target to neutralize its electrical control systems without simultaneously exposing the pilot or other human cargo to unhealthy radiation. The microwave antenna is unmatched in the rapidity and swath of its beam steering and can be used for directed energy weapons (DEW) engagements with moving targets both on the ground and in the air. The highly steerable antenna is the first of its kind to use twist-reflector and transreflector technology in a high-power microwave (HPM) capable configuration. The power for the microwave is first generated by an internal combustion or jet engine, that feeds to a pulse forming network or Marx bank, that, in turn, drives a high power microwave (HPM) generator, such as s super-reltron, relativistic-magnetron, virtual cathode oscillator, or relativistic Klystron, to produce the microwave radiation for channeling through the waveguide to the feed horn. The research and development efforts that produced the technology was funded by the US Army Research Laboratory (ARL). In May 2003. the weapon earned US Patent # 6,559,807. In the patent inventor Robert A. Koslover says it was determined that a high-peak power microwave transmission, on the order of more than 100 megawatts (MW) of energy, confined to a very tight beam ("pencil beam") using an L-band antenna, lightweight (less than 250 kg) and compact enough to be deployed on a land vehicle or an air platform, could find wide use in intercepting a target and degrading or neutralizing the electronic control monitoring systems and directional control systems in such targets as flying missiles and piloted aircraft as a means of rendering them ineffective without injuring human life. In other situations, civil authorities may find use for the device to neutralize the electrical system and computer-driven controls of an automobile or other motor vehicle thereby eliminating the need for extended car chase situations by police authorities that often result in destruction of property and severe injury or death to participants and members of the public. By combining observations from the Japan-led Suzaku X-ray satellite and the European Space Agency's infrared Herschel Space Observatory, scientists have connected a fierce "wind" produced near a galaxy's monster black hole to an outward torrent of cold gas a thousand light-years across. The finding validates a long-suspected feedback mechanism enabling a supermassive black hole to influence the evolution of its host galaxy. "This is the first study directly connecting a galaxy's actively 'feeding' black hole to features found at much larger physical scales," said lead researcher Francesco Tombesi, an astrophysicist at NASA's Goddard Space Flight Center in Greenbelt, Maryland, and the University of Maryland, College Park (UMCP). "We detect the wind arising from the luminous disk of gas very close to the black hole, and we show that it's responsible for blowing star-forming gas out of the galaxy's central regions." This artist's rendering shows a galaxy being cleared of interstellar gas, the building blocks of new stars. 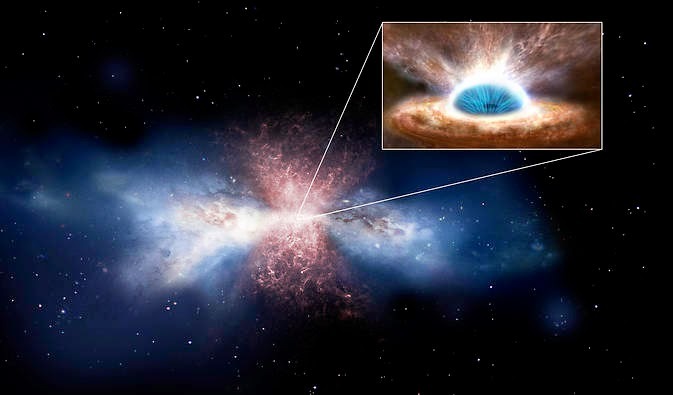 New X-ray observations by Suzaku have identified a wind emanating from the black hole's accretion disk (inset) that ultimately drives such outflows. Star formation takes place in cold, dense molecular clouds. By heating and dispersing gas that could one day make stars, the black-hole wind forever alters a large portion of its galaxy. 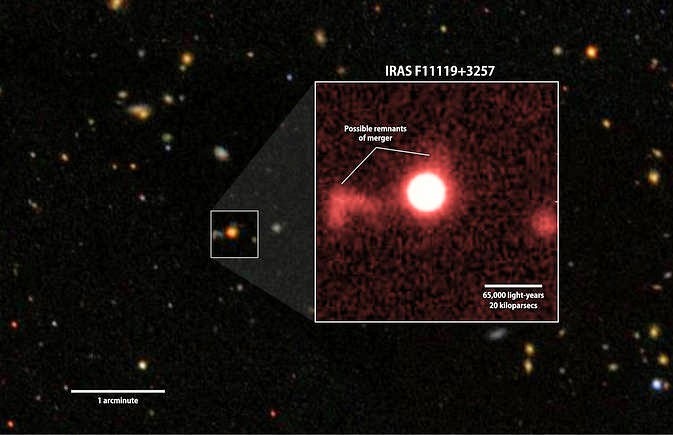 In a study published in the March 26 edition of Nature, Tombesi and his team report the connection in a galaxy known as IRAS F11119+3257, or F11119 for short. The galaxy is so distant, its light has been traveling to us for 2.3 billion years, or about half the present age of our solar system. Like most galaxies, including our own Milky Way, F11119 hosts a supersized black hole, one estimated at 16 million times the sun's mass. The black hole's activity is fueled by a rotating collection of gas called an accretion disk, which is some hundreds of times the size of our planetary system. Closest to the black hole, the orbiting matter reaches temperatures of millions of degrees and is largely responsible for the galaxy's enormous energy output, which exceeds the sun's by more than a trillion times. The galaxy is heavily enshrouded by dust, so most of this emission reaches us in the form of infrared light. A red-filter image of IRAS F11119+3257 (inset) from the University of Hawaii's 2.2-meter telescope shows faint features that may be tidal debris, a sign of a galaxy merger. Background: A wider view of the region from the Sloan Digital Sky Survey. The new findings resolve a long-standing puzzle. Galaxies show a correlation between the mass of their central black holes and stellar properties across a much larger region called the galactic bulge. Galaxies with more massive black holes usually possess bulges with proportionately greater stellar mass and faster-moving stars. Black holes grow the same way their host galaxies do, by colliding and merging with their neighbors. But mergers disrupt galaxies, which leads to greatly enhanced star formation and sends a flood of gas toward the merged black hole. The process should scramble any simple relationship between the black hole's growth and the galaxy's evolution, yet it doesn't. This animation illustrates how black-hole feedback works in quasars. Dense gas and dust in the center simultaneously fuels the black hole and shrouds it from view. The black-hole wind propels large-scale outflows of cold gas and powers a shock wave that clears gas and dust from the central galaxy. "These connections suggested the black hole was providing some form of feedback that modulated star formation in the wider galaxy, but it was difficult to see how," said team member Sylvain Veilleux, an astronomy professor at UMCP. "With the discovery of powerful molecular outflows of cold gas in galaxies with active black holes, we began to uncover the connection." In 2013, Veilleux led a search for these outflows in a sample of active galaxies using the Herschel Space Observatory. In F11119, the researchers identified a strong outflow of hydroxyl molecules moving at about 2 million mph (3 million kph). Other studies using different trace molecules found similar flows. In the present study, Tombesi, Veilleux and their colleagues estimate that this outflow operates up to 1,000 light-years from the galaxy's center and calculate that it removes enough gas to make 800 copies of our sun. In May 2013, the team observed F11119 using Suzaku's X-ray Imaging Spectrometer, obtaining an effective exposure of nearly three days. The galaxy's spectrum indicates that X-ray-absorbing gas is racing outward from the innermost accretion disk at 170 million mph (270 million kph), or about a quarter the speed of light. The region is possibly half a billion miles (800 million km) from the brink of the black hole, and about as close to the point where not even light can escape as Jupiter is from the sun. "The black hole is ingesting gas as fast as it can and is tremendously heating the accretion disk, allowing it to produce about 80 percent of the energy this galaxy emits," said co-author Marcio Meléndez, a research associate at UMCP. "But the disk is so luminous some of the gas accelerates away from it, creating the X-ray wind we observe." Taken together, the disk wind and the molecular outflow complete the picture of black-hole feedback. The black-hole wind sets cold gas and dust into motion, giving rise to the molecular outflow. It also heats dust enshrouding the galaxy, leading to the formation of an outward-moving shock wave that sweeps away additional gas and dust. When the black hole shines at its brightest, the researchers say, it's also effectively pushing away the dinner plate, clearing gas and dust from the galaxy's central regions and shutting down star formation there. Once the dust has been cleared out, shorter-wavelength light from the disk can escape more easily. Scientists think ultra-luminous infrared galaxies like F11119 represent an early phase in the evolution of quasars, a type of black-hole-powered galaxy with extreme luminosity across a broad wavelength range. According to this picture, the black hole will eventually consume its surrounding gas and gradually end its spectacular activity. As it does so, it will evolve from a quasar to a gas-poor galaxy with a relatively low level of star formation. The researchers hope to detect and study this process in other galaxies and look forward to the improved sensitivity of Suzaku's successor, ASTRO-H. Expected to launch in 2016, ASTRO-H is being developed at the Institute of Space and Astronautical Science of the Japan Aerospace Exploration Agency (ISAS/JAXA), in collaboration with NASA Goddard and Japanese institutions. 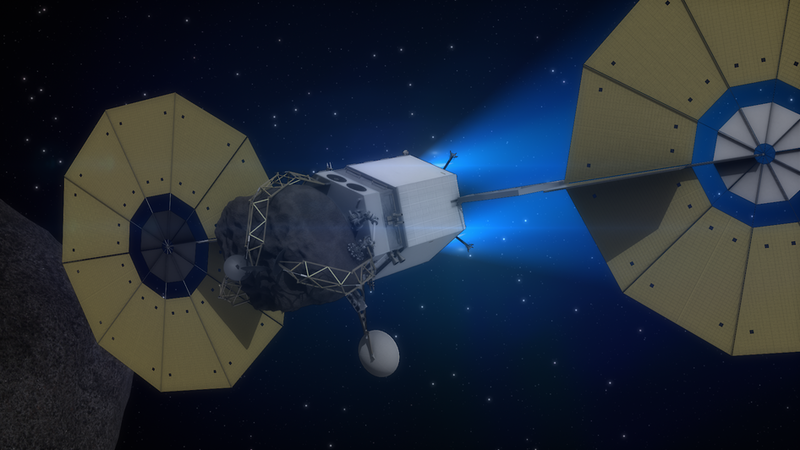 NASA Wednesday announced more details in its plan for its Asteroid Redirect Mission (ARM), which in the mid-2020s will test a number of new capabilities needed for future human expeditions to deep space, including to Mars. NASA also announced it has increased the detection of near-Earth asteroids by 65 percent since launching its asteroid initiative three years ago. The Asteroid Redirect Vehicle conducts one of the 1 km fly-bys that are used to characterize and image the asteroid with a resolution of up to 1 cm. 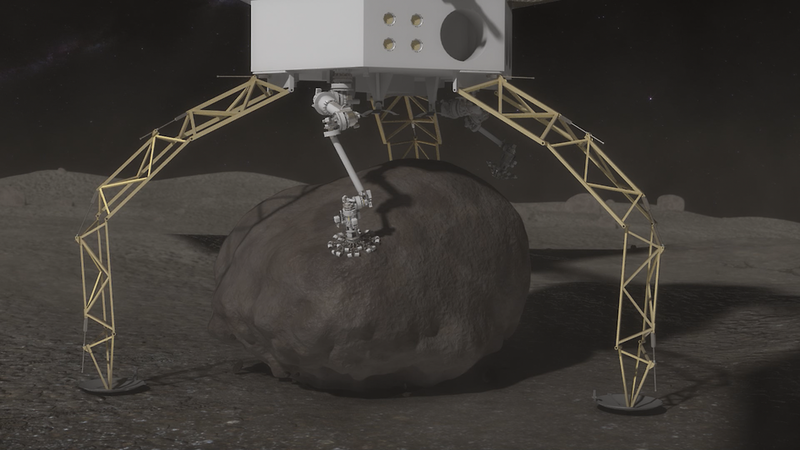 For ARM, a robotic spacecraft will capture a boulder from the surface of a near-Earth asteroid and move it into a stable orbit around the moon for exploration by astronauts, all in support of advancing the nation’s journey to Mars. Microspine grippers on the end of the robotics arms are used to grasp and secure the boulder. The microspines use thousands of small spines to dig into the boulder and create a strong grip. An integrated drill will be used to provide final anchoring of the boulder to the capture mechanism. "The Asteroid Redirect Mission will provide an initial demonstration of several spaceflight capabilities we will need to send astronauts deeper into space, and eventually, to Mars," said NASA Associate Administrator Robert Lightfoot. "The option to retrieve a boulder from an asteroid will have a direct impact on planning for future human missions to deep space and begin a new era of spaceflight." 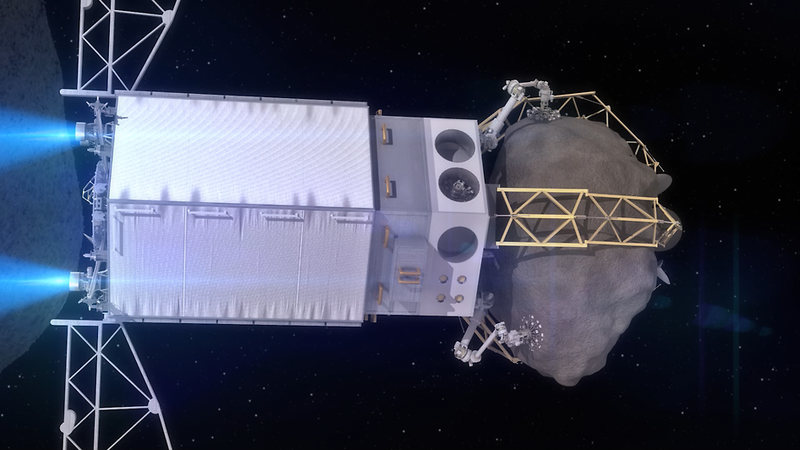 Asteroid Capture: Once the boulder is secured, the ARV will mechanically push off, or “hop,” from the surface and then use thrusters to ascend from the asteroid’s surface. 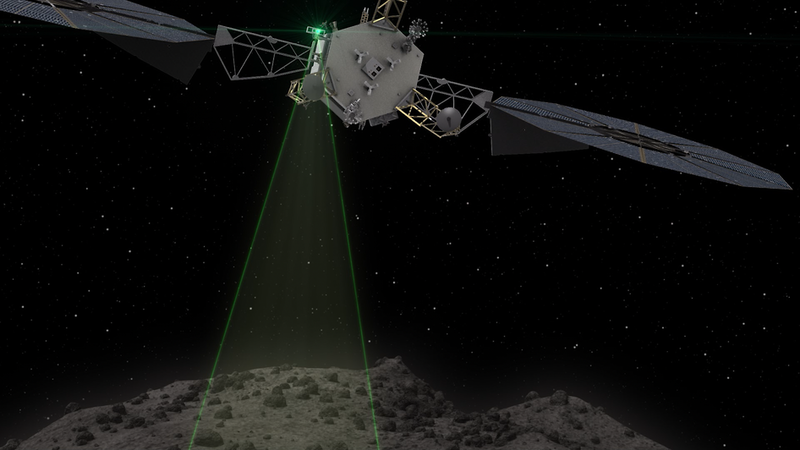 The agency plans to announce the specific asteroid selected for the mission no earlier than 2019, approximately a year before launching the robotic spacecraft. Before an asteroid is considered a valid candidate for the mission, scientists must first determine its characteristics, in addition to size, such as rotation, shape and precise orbit. NASA has identified three valid candidates for the mission so far: Itokawa, Bennu and 2008 EV5. The agency expects to identify one or two additional candidates each year leading up to the mission. Asteroid Redirect Vehicle Landing: Once the boulder is secured, the Capture and Restraint System legs will provide a mechanical push off that will separate the boulder from the surface and provide an initial ascent without the use of thrusters to limit the amount of debris created. 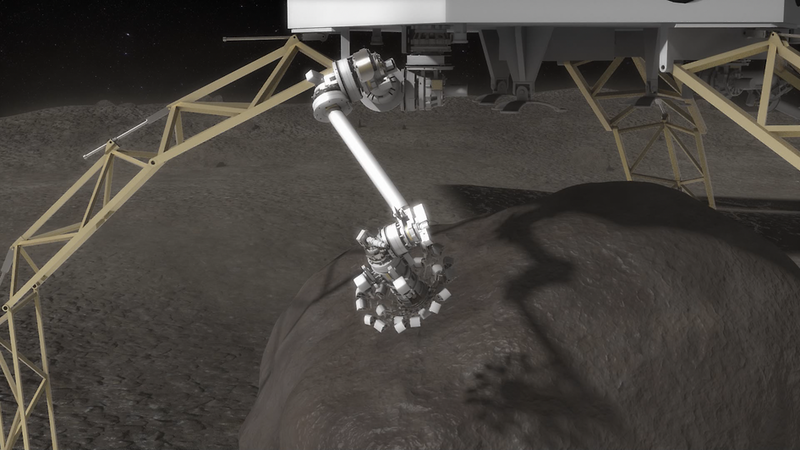 Following its rendezvous with the target asteroid, the uncrewed ARM spacecraft will deploy robotic arms to capture a boulder from its surface. It then will begin a multi-year journey to redirect the boulder into orbit around the moon. Close-up of the Asteroid Redirect Vehicle departing the asteroid after capturing a boulder from its surface. Throughout its mission, the ARM robotic spacecraft will test a number of capabilities needed for future human missions, including advanced Solar Electric Propulsion (SEP), a valuable capability that converts sunlight to electrical power through solar arrays and then uses the resulting power to propel charged atoms to move a spacecraft. This method of propulsion can move massive cargo very efficiently. While slower than conventional chemical rocket propulsion, SEP-powered spacecraft require significantly less propellant and fewer launches to support human exploration missions, which could reduce costs. The asteroid redirect vehicle demonstrates the “gravity tractor” planetary defense technique on a hazardous-size asteroid. The gravity tractor method leverages the mass of the spacecraft to impart a gravitational force on the asteroid, slowly altering the asteroid’s trajectory. The demonstration is conducted after capturing the boulder and is referred to as the “enhanced gravity tractor” because the additional mass of the boulder enhances the force that can be transmitted to the asteroid. Future SEP-powered spacecraft could pre-position cargo or vehicles for future human missions into deep space, either awaiting crews at Mars or staged around the moon as a waypoint for expeditions to the Red Planet. 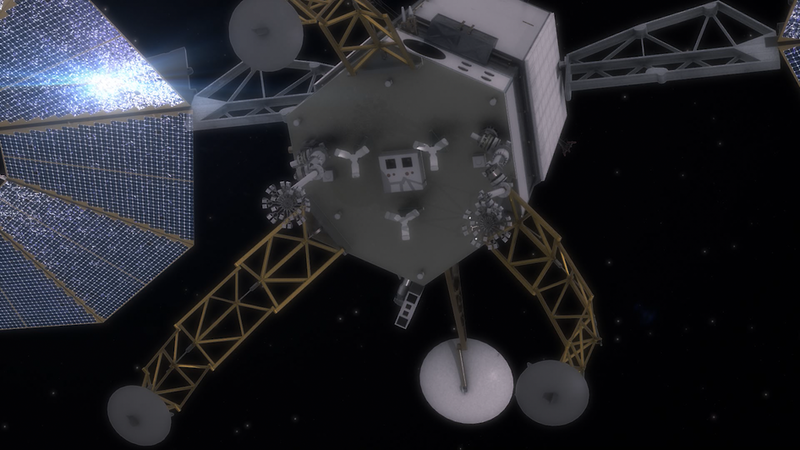 The Asteroid Redirect Vehicle travels toward a stable orbit around the moon with the captured asteroid boulder. The vehicle’s solar arrays collect power from the sun and convert it to energy to ionize and accelerate xenon propellant, resulting in the bright blue plume at the rear of the vehicle. ARM's SEP-powered robotic spacecraft will test new trajectory and navigation techniques in deep space, working with the moon's gravity to place the asteroid in a stable lunar orbit called a distant retrograde orbit. This is a suitable staging point for astronauts to rendezvous with a deep space habitat that will carry them to Mars. An astronaut, anchored to a foot restraint, prepares to investigate the asteroid boulder. In 2005, NASA's Deep Impact comet science mission tested technology that could assist in changing the course of a near-Earth object using a direct hit with a spacecraft. The ARM robotic spacecraft opens a new and second option for planetary defense using a technique called a gravity tractor. All mass exerts and experiences gravity and, in space, the gravitational attraction even between masses of modest size can significantly affect their motion. This means that by rendezvousing with the asteroid and holding a halo orbit in the appropriate direction, the ARM robotic spacecraft can slowly pull the asteroid without touching it. The effectiveness of this maneuver is increased, moreover, if mass is moved from the asteroid to the spacecraft by the capture of a boulder. The Asteroid Redirect Vehicle descends to the asteroid’s surface following a series of dry-runs that are used to verify vehicle performance. It will take approximately six years for the ARM robotic spacecraft to move the asteroid mass into lunar orbit. In the mid-2020s, NASA's Orion spacecraft will launch on the agency’s Space Launch System rocket, carrying astronauts on a mission to rendezvous with and explore the asteroid mass. The current concept for the crewed mission component of ARM is a two-astronaut, 24-25 day mission. This crewed mission will further test many capabilities needed to advance human spaceflight for deep space missions to Mars and elsewhere, including new sensor technologies and a docking system that will connect Orion to the robotic spacecraft carrying the asteroid mass. Astronauts will conduct spacewalks outside Orion to study and collect samples of the asteroid boulder wearing new spacesuits designed for deep space missions. Collecting these samples will help astronauts and mission managers determine how best to secure and safely return samples from future Mars missions. 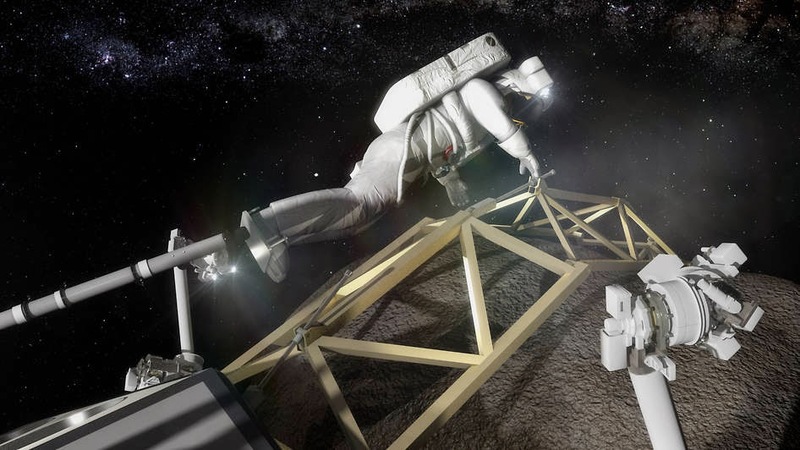 And, because asteroids are made of remnants from the formation of the solar system, the returned samples could provide valuable data for scientific research or commercial entities interested in asteroid mining as a future resources. "Asteroids are a hot topic," said Jim Green, director of NASA Planetary Science. "Not just because they could pose a threat to Earth, but also for their scientific value and NASA's planned mission to one as a stepping stone to Mars." In addition to NASA's ongoing work detecting and cataloging asteroids, the agency has engaged the public in the hunt for these space rocks through the agency's Asteroid Grand Challenge activities, including prize competitions. During the recent South by Southwest Festival in Austin, Texas, the agency announced the release of a software application based on an algorithm created by a NASA challenge that has the potential to increase the number of new asteroid discoveries by amateur astronomers. Jupiter may have swept through the early solar system like a wrecking ball, destroying a first generation of inner planets before retreating into its current orbit, according to a new study published March 23 in Proceedings of the National Academy of Sciences. The findings help explain why our solar system is so different from the hundreds of other planetary systems that astronomers have discovered in recent years. Jupiter is thought to have migrated inward toward the sun before retreating to its current position in the solar system. 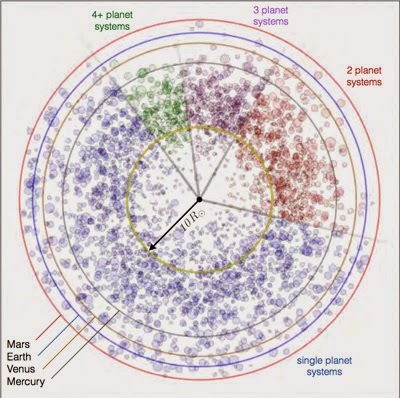 "Now that we can look at our own solar system in the context of all these other planetary systems, one of the most interesting features is the absence of planets inside the orbit of Mercury," said Gregory Laughlin, professor and chair of astronomy and astrophysics at UC Santa Cruz and coauthor of the paper. "The standard issue planetary system in our galaxy seems to be a set of super-Earths with alarmingly short orbital periods. Our solar system is looking increasingly like an oddball." The new paper explains not only the "gaping hole" in our inner solar system, he said, but also certain characteristics of Earth and the other inner rocky planets, which would have formed later than the outer planets from a depleted supply of planet-forming material. Laughlin and coauthor Konstantin Batygin explored the implications of a leading scenario for the formation of Jupiter and Saturn. In that scenario, proposed by another team of astronomers in 2011 and known as the "Grand Tack," Jupiter first migrated inward toward the sun until the formation of Saturn caused it to reverse course and migrate outward to its current position. This diagram shows the orbital distribution of extrasolar planets smaller than Jupiter that have been detected by the Kepler mission, in comparison to the orbits of Mercury, Venus, Earth, and Mars. Most of these extrasolar planets are much closer to their host stars than the innermost planets of our solar system are to the sun. Batygin, who first worked with Laughlin as an undergraduate at UC Santa Cruz and is now an assistant professor of planetary science at the California Institute of Technology, performed numerical calculations to see what would happen if a set of rocky planets with close-in orbits had formed prior to Jupiter's inward migration. At that time, it's plausible that rocky planets with deep atmospheres would have been forming close to the sun from a dense disk of gas and dust, on their way to becoming typical "super-Earths" like so many of the exoplanets astronomers have found around other stars. As Jupiter moved inward, however, gravitational perturbations from the giant planet would have swept the inner planets (and smaller planetesimals and asteroids) into close-knit, overlapping orbits, setting off a series of collisions that smashed all the nascent planets into pieces. The resulting debris would then have spiraled into the sun under the influence of a strong "headwind" from the dense gas still swirling around the sun. The ingoing avalanche would have destroyed any newly-formed super-Earths by driving them into the sun. A second generation of inner planets would have formed later from the depleted material that was left behind, consistent with evidence that our solar system's inner planets are younger than the outer planets. The resulting inner planets--Mercury, Venus, Earth, and Mars--are also less massive and have much thinner atmospheres than would otherwise be expected, Laughlin said. "One of the predictions of our theory is that truly Earth-like planets, with solid surfaces and modest atmospheric pressures, are rare," he said. Planet hunters have detected well over a thousand exoplanets orbiting stars in our galaxy, including nearly 500 systems with multiple planets. What has emerged from these observations as the "typical" planetary system is one consisting of a few planets with masses several times larger than the Earth's (called super-Earths) orbiting much closer to their host star than Mercury is to the sun. In systems with giant planets similar to Jupiter, they also tend to be much closer to their host stars than the giant planets in our solar system. The rocky inner planets of our solar system, with relatively low masses and thin atmospheres, may turn out to be fairly anomalous. 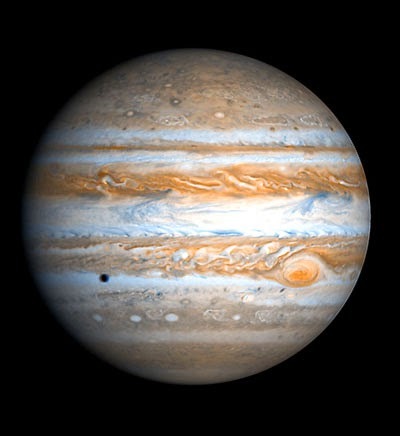 According to Laughlin, the formation of giant planets like Jupiter is somewhat rare, but when it occurs the giant planet usually migrates inward and ends up at an orbital distance similar to Earth's. Only the formation of Saturn in our own solar system pulled Jupiter back out and allowed Mercury, Venus, Earth, and Mars to form. Therefore, another prediction of the paper is that systems with giant planets at orbital periods of more than about 100 days would be unlikely to host multiple close-in planets, Laughlin said. "This kind of theory, where first this happened and then that happened, is almost always wrong, so I was initially skeptical," he said. "But it actually involves generic processes that have been extensively studied by other researchers. There is a lot of evidence that supports the idea of Jupiter's inward and then outward migration. Our work looks at the consequences of that. Jupiter's 'Grand Tack' may well have been a 'Grand Attack' on the original inner solar system." In a 2010 study, scientists say baby Jupiter was so strongly bashed by giant Earths that it lost part of its core. That would explain why Jupiter's core is disproportionately smaller today than sibling planet Saturn, says astronomer Douglas Lin, with the University of California in Santa Cruz. Scientists suspect that gas giant planets like Jupiter and Saturn started off with rocky and/or icy bodies about 10 times the mass of Earth. At that point, their gravitational muscles would be strong enough to begin pulling gas from the surrounding region, causing them to balloon in size over time. "In principle, all gas giants need to get to a critical core mass before they can start to accrete gas," Lin told Discovery News. "So the question is: Why is Jupiter's core mass so much smaller than Saturn's even though its total mass is so much bigger?" Working with computer models, astronomers Shu Lin Li of Peking University in China, Craig Agnor with Queen Mary University of London, and Lin came up with one possible answer: Perhaps Jupiter started off like Saturn, but lost part of its core as it evolved. The scientists calculated that if an object roughly five times the mass of Earth hit Jupiter, the impact would strike all the way to the planet's core. Add another three or four crashes and Jupiter's core would be eroded to roughly what it is today. "Jupiter has always had this problem because if we believe the numbers... the core seems to be too small -- so small that it cannot accrete gas efficiently in the solar nebula. This scenario gets around the problem," Lin said.